It’s a fun diversion that is, unfortunately, difficult to replicate in waking consciousness. 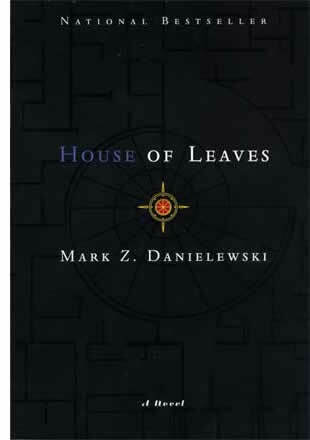 But you can come close by reading Mark Z. Danielewski’s House of Leaves, a 2000 horror novel that is more of an entity than a book. Designed with multiple fonts and colors, footnotes within footnotes and text running backward, forward, upside down, even spiraling, the physical layout of the text manipulates the novel’s pacing and creates a somewhat interactive experience. It’s probably as close as we’ve come to reading with 3-D glasses. The narrative is equally layered and complex, and academics have taken multiple stabs at this book. I would guess it’s had the most scholarly treatments of any horror novel since Frankenstein. Therefore, I won’t even attempt to offer an academic account, as I don’t have anything particularly profound to say on that front (and would bore myself to tears in the process). Can we trust what we see and read? Hell no. And that’s why House of Leaves is so unnerving. I think of it as a literary haunted house. Every October, people line up outside strip malls, warehouses and amusement parks to navigate dark, disorienting hallways. They know they won’t be harmed, but will experience the thrill of uncertainty. The same with House of Leaves. It elicits a visceral reaction in a way few other books can. We’re aware of what Danielewski is doing. When we need to rotate the book to read the text, we know it’s to recreate the impossible geometry of the staircase. When there is one word of text on a page, it’s to replicate the cavernous quality of the basement and to force us to read slower. But we’re affected just the same, as when we’re knowingly manipulated inside a haunted house. House of Leaves is not a quick read. It is an experience. If you started reading it today, I don’t know that you could finish it by Halloween. But I feel confident in saying that you’re not supposed to read it that quick. This is a book to be absorbed. It should age along with you. Read correctly, you will internalize the disorientation. You will want to measure the length of every hallway in your house to find inconsistencies. To make sure, every day, that the dimensions of your world haven’t changed while you were sleeping. Because in Danielewski’s world, they do change. Sometimes they’ll shift right under your feet, and they might even swallow you whole.